static const Field PasswordField = "password"
static const Field RememberMeField = "remember-me"
static const Field LoginNameField = "user-name"
Model for implementing an authentication view. 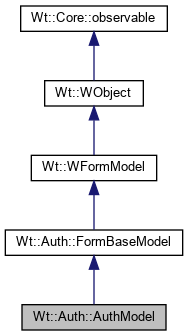 This model implements the logic for authenticating a user (the "login" interface). It implements traditional username/password registration, and third party identification methods (although for the latter, it doesn't really do anything). RememberMeField: whether the login should be remembered with an authentication cookie (if that is configured in the AuthService). When the model validates correctly (validate() returns true), the entered credentials are correct. At that point you can use the login() utility function to login the identified user. The model can also be used when the user is already known (e.g. to implement password confirmation before a critical operation). In that case you can set a value for the LoginNameField and make this field invisible or read-only. Creates a new authentication model, using a basic authentication service and user database. Logs in the user after a successful call to validate(). To avoid mishaps, you should call this method immediately after a call to validate(). Returns whether the user could be logged in. This also removes the remember-me cookie for the user. Detects and processes an authentication token. This returns a user that was identified with an authentication token found in the application environment, or an invalid User object if this feature is not configured, or no valid cookie was found. Creates a token and stores it in a cookie. This enables automatic authentication in a next session. This should be called after a call to attemptPasswordLogin(), if you want to reflect throttling using a client-side count-down indicator in the button. You need to call configureThrottling() before you can do this.